How to calculate stopping distances! Now you can just choose to try and remember these figures, but they can be quite hard to remember, so there are methods to work out the figures, you just need to be relatively good at math's. This is how long it takes on average to 'think' about braking for a hazard, the thinking distance (in feet) is simply the speed. For example at 20mph the thinking distance is 20 feet, at 30mph it is 30 feet and so on. On the Highway Code they say the actual braking distance at 40mph is 78 feet, we got 80 feet. So it is 2 foot out, however on the theory test you will be given multiple choice questions so just go for the answer closest to the one you calculated. 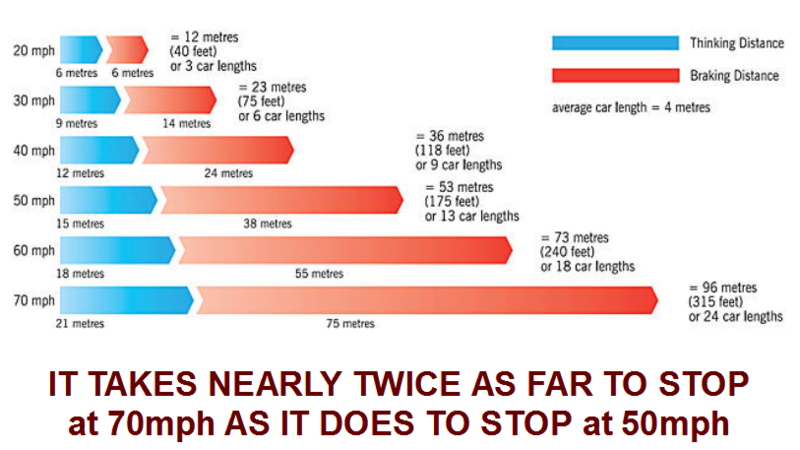 This is simply the 'thinking distance' added to the 'braking distance', so at 40mph it would be 40 + 80 = 120 feet. Again we are 2 foot out from the actual answer but these calculations should be enough to work it out for your theory test. As you may suspect the figures in the Highway Code are not very accurate in the real world, this is due to various factors that can effect your stopping distance, for example the car (condition/quality of tyres & brakes, weight of car) and driver (are they distracted i.e. using a mobile phone or talking to passengers? tired/fatigued?). If we take the example of a driver being distracted by using their mobile phone when travelling at 50mph and how it effects their thinking distance. The driver looks at their phone for 2 seconds, that is not long right? Well at 50mph you travel 75 feet per second, so in that 2 seconds you have looked down at your phone you have travelled 150 feet or 11.4 car lengths. To put it another way if there was another vehicle 11 car lengths in front of you then you would hit them at the full 50mph before you even moved your foot to the brake, or even looked up away from your phone! If your car also had illegal tyres, with low tread, and the brake pads were badly worn then that would also drastically increase your braking distance. A distracted driver with a car in poor condition is an accident waiting to happen, they have very little chance of reacting in an emergency situation. Keep a Safe Following Distance - The Highway Code recommends you keep AT LEAST a 2 second gap from the car in front (in good dry road conditions). 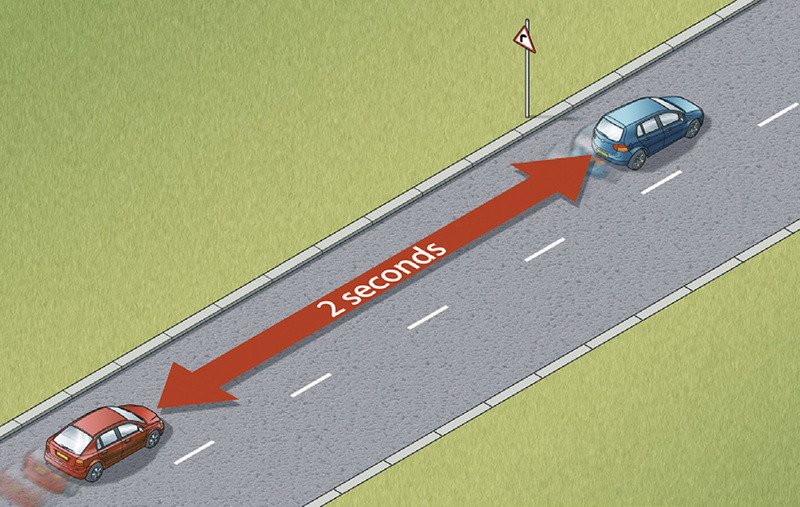 To judge a 2 second gap you wait for the car in front to pass a fixed object (for example a lamp post or road sign) and then count 2 seconds, this can be done by saying the phrase "only a fool brakes the two second rule" (which takes 2 seconds to say), if you can say the phrase before reaching the fixed object then you are a safe distance behind, if you can't say the phrase they increase your following distance (i.e. drop further back from the car in front). In wet conditions AT LEAST a 4 second gap should be kept, and in icy conditions AT LEAST a 20 second gap should be kept. Are Your Ready for The Vehicle in Front to Stop Suddenly? Vehicle in front brakes suddenly, can the driver behind react in time? Tyre of truck in front blows, can you stop in time to avoid crashing in the back of the truck?